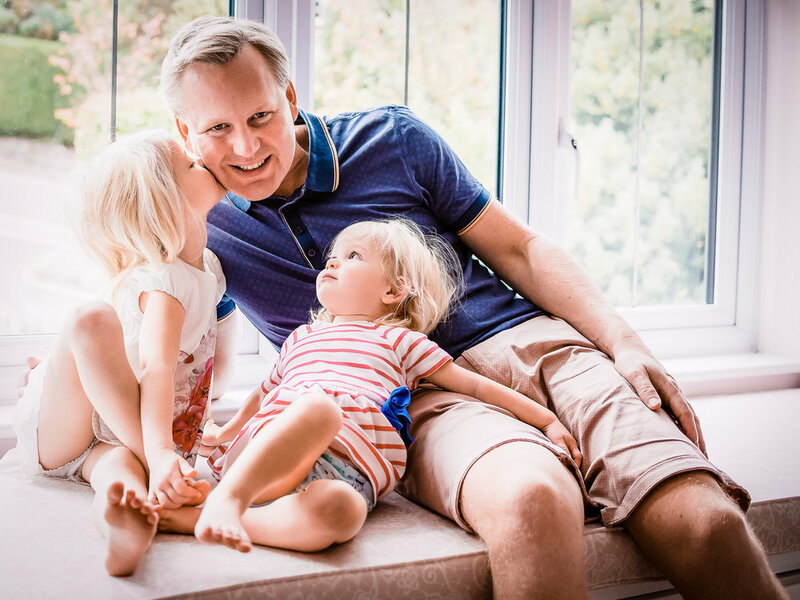 I was recently invited into the home of Kate and David to do a family photography at home in Sevenoaks session. It was a beautiful morning and I'd arranged with Kate that we would start the session with the girls in their nightclothes, so we could get some fun shots of them jumping on the bed and snuggling with their mummy and each other. The girls read a favourite book. We had such a lovely time. Kate and David have such a beautiful home and when I spotted their stunning en suite bathroom, I couldn't help but ask the girls to jump in so we could have some fun with some bath shots! Kate loved this shot and had it printed quite large to hang in the same room and enjoy every day. It's a perfect frozen moment in time of two cheeky monkeys. 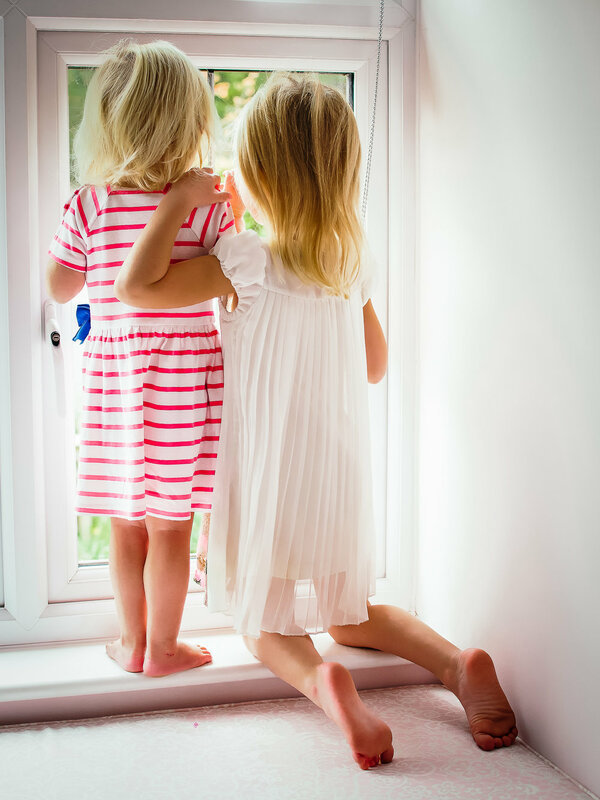 The girls then got dressed in beautiful dresses and proceeded to show me all of their favourite toys, including their fabulous dolls house and their psychedelic teddy bears and we took a moment to have snuggles with Mummy & Daddy on the gorgeous window seat in one of the bedrooms. I love these shots. Such a beautiful connection between these two little girls and their Mummy & Daddy and with each other - it's wonderful! We headed downstairs and had some fun in their playroom then. The girls did some colouring and, when Kate brought out the family bunny, much fun was had playing with it on the brilliant yellow sofa. 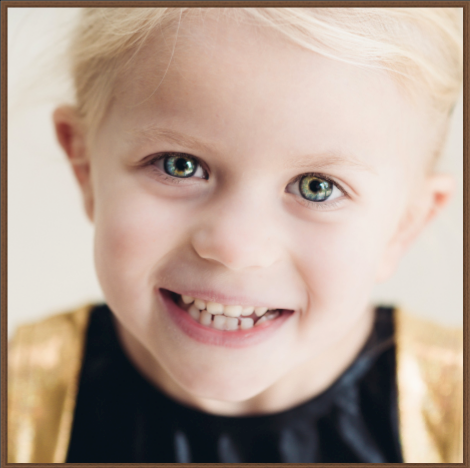 Kate chose a gorgeous set of 4 images to put in a 20x20" frame. This amazing sofa is so striking and it looks great against the simple white wood that she chose. Kate was kind enough to send me a photo of the frame up on the wall. It's hanging to the right of this image above and works perfectly with Kate's colour scheme in the room as the yellow pops on the wall as a accent to her yellow sofa. We went to play in the garden. These girls know how to have fun! They drove in their tractor, bounced on their trampoline, played on their swing and did some gymnastics. It was such lovely morning. Finally, I knew that Kate really liked the up close portraits that I had done of my own boys so I wanted to make sure that I created something similar for her. I just love how these two shots turned out. Kate did too and chose 12x12" frames of each to hang in her bedroom and now she has this beautiful record of her two little girls at this utterly adorable stage of life to greet her every morning when she wakes up. The printers I use assure me that these prints are made to last a lifetime so these will become all the more precious when these two little ones are bigger. If you would like to book your own family photoshoot, I will be announcing my available dates through April and May in a few weeks. If you would like to be added to my waiting list, you will be the first to hear of my dates. Get in touch below to be added.